To provide the most complete service available to all our clients. If you are a developer, project manager or private client, Custom Install Limited provide the total solution package. There is no need to deal with third parties when dealing with us. We do everything required to bring your project to life. Custom Install limited are a dedicated Custom Installation company based in Guildford in Surrey. From Guildford we design, supply and install custom home cinema and multi room systems all over Surrey, Hampshire, Sussex and London. Following initial consultation, our designers will propose a solution that caters for all your needs. We listen carefully to everything you require from your system and make sure it not only delivers, but exceeds your expectations. Once the specification is agreed you can relax. From here on, we look after every stage of the process. 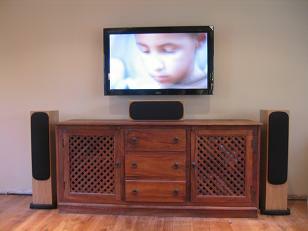 Home cinema and multi room systems need to be flexible and adjust to individual circumstances. In order to achieve this, Custom Install Limited deal with an enormous range of products. From Plasma screens and projectors right through to cabinets and seating. All aspects of the installation are dealt with by our own installers. We try where possible to ensure that the same team see the project through from the early stages of the first fix, right the way through to final commissioning. Custom Install Limited received a desperate call in March 2010, from local RSL Echo FM, who were unable to broadcast due to an alternative suppliers incorrectly installed equipment. Once our rescue proposal had been accepted the station was back on air with a newly installed antenna, transmitter, RDS encoder and Digital Optimod in just a few hours! Custom Install Limited provide transmission solution for Echo 106.8FM's 2009 RSL broadcast. Including FM transmitter, digital Optimod, RDS encoder and spatial enhancer. Wales Rally FM uses transmitters from Custom Install Limited to cover the Wales Rally in the key locations of Cardiff and Swansea during December 2008. Custom Install Limited selected to supply broadcast transmission services to Farnborough International Airshow 2008.